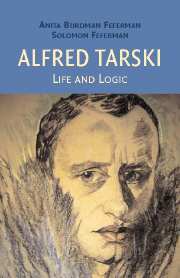 Alfred Tarski, one of the greatest logicians of all time, is widely thought of as ‘the man who defined truth’. His work on the concepts of truth and logical consequence are cornerstones of modern logic, influencing developments in mathematics, philosophy, linguistics, and computer science. Tarski was a charismatic teacher and zealous promoter of his view of logic as the foundation of all rational thought, a bon vivant and a womanizer, who played the ‘great man’ to the hilt. Born in Warsaw in 1901 to Jewish parents, he changed his name and converted to Catholicism but was never able to obtain a professorship in his home country. A fortuitous trip to the United States at the outbreak of World War II saved his life and turned his career around, even while it separated him from his family for years. By the war’s end he was established as a professor of mathematics at the University of California, Berkeley. There Tarski built an empire in logic and methodology that attracted students and distinguished researchers from all over the world. From the cafés of Warsaw and Vienna to the mountains and deserts of California, this first full-length biography places Tarski in the social, intellectual, and historical context of his times and presents a frank, vivid picture of a personally and professionally passionate man - interlaced with an account of his major scientific achievements.